Persistence Market Research (PMR) offers an 8-year forecast on the global immune checkpoint inhibitors market. The primary objective of the report is to offer updates and information related to market opportunities in the global immune checkpoint inhibitors market. In terms of revenue, the global immune checkpoint inhibitors market is expected to register a CAGR of 14.6% during the forecast period, 2018–2026. The primary objective of the report is to offer insights on the market dynamics that can influence the growth of the global immune checkpoint inhibitors market over the forecast period. 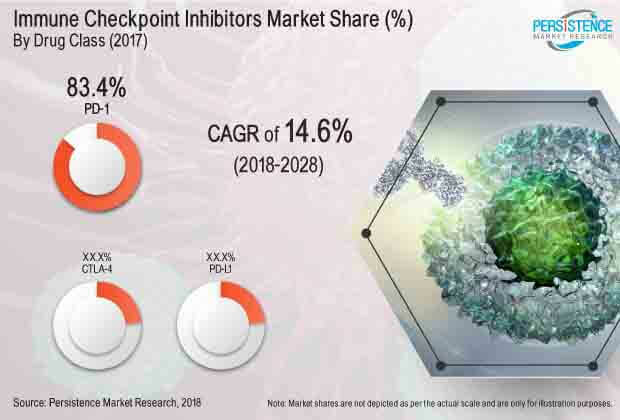 Insights on the key trends, drivers, restraints, value forecasts and opportunities for companies operating in the global immune checkpoint inhibitors market are presented in the report. The global market for immune checkpoint inhibitors is expected to witness high growth in terms of value in high economic countries due to fast FDA approvals for novel and innovative immune checkpoint inhibitors through combination therapy coupled with growing adoption of immune checkpoint inhibitors for cancer treatment. Additionally, increasing investments in the research and development sector for the approval of immune checkpoint inhibitors for other cancer applications is also expected to drive the growth of the market for immune checkpoint inhibitors. The revenue from the immune checkpoint inhibitors market in Asia Pacific is expected to expand at the relatively higher CAGR due to growing adoption of drugs and therapies for cancer and increased approvals of immune checkpoint inhibitors in the region. To understand and assess the opportunities in this market, the report offers the market forecast on the basis of segment type classified into the drug class, therapeutic application, distribution channel and regions. The report provides analysis of the global immune checkpoint inhibitors market in terms of market value (US$ Mn). The report begins with the market definition of immune checkpoint inhibitors, followed by definitions of the different drug class. The market dynamics section includes PMR’s analysis on key trends, drivers, restraints, opportunities and macro-economic factors influencing the growth of the global immune checkpoint inhibitors market. In addition, we have considered year-on-year (Y-o-Y) growth to understand the predictability of the market and identify growth opportunities for companies operating in the global immune checkpoint inhibitors market. Another key feature of this report is the analysis of key segments in terms of absolute dollar opportunity. This is usually overlooked while forecasting the market. However, absolute dollar opportunity is critical for assessing the level of opportunity that a provider can look to achieve, as well as to identify potential resources from a sales and delivery perspective for services offered by the canine arthritis treatment market. To understand the key segments in terms of their growth and performance in the global immune checkpoint inhibitors market, Persistence Market Research has developed a market attractiveness index. The resulting index will help identify the existing market opportunities in immune checkpoint inhibitors market. In the final section of the report, the ‘competitive landscape’ has been included to provide a dashboard view of the key companies operating in the global immune checkpoint inhibitors market. This section is primarily designed to provide clients with an objective and detailed comparative assessment of the key providers specific to a market segment in the immune checkpoint inhibitors market. However, this section also includes market strategies and SWOT analysis of the key players operating in the global immune checkpoint inhibitors market. Detailed profiles of immune checkpoint inhibitors drug manufacturers are also included in the scope of the report to evaluate their long- and short-term strategies. Examples of some of the key players operating in the immune checkpoint inhibitors market are Bristol-Myers Squibb, AstraZeneca, Merck KGaA, Merck & Co, Novartis AG, Sanofi, Roche Holdings AG, Incyte Corporation, among others. Immune checkpoints are proteins that play an important role in regulating the immune system. In cancer, the immune checkpoints are activated to suppress the anti-tumor activity of the immune system thereby suppressing the immune response against the cancer cells. The study of these proteins and pathways has led to the development of a number of immune checkpoint inhibitors as therapies against cancer. Initial preclinical studies showed that antibody blockade of the immune checkpoint molecule CTLA-4 resulted in successful anti-tumor immune responses in the murine cancer models. This was then followed by studies targeting the PD-1/PD-L1 pathway. Ipilimumab and Yervoy were the first immune checkpoint inhibitors introduced in the market. With the promising results of Yervoy, several anti-PD-1 and anti-PD-L1 antibodies have been developed. Although there are number of other checkpoints that have been studied, such as LAG-3 and TIM-3, the only approved immune checkpoint inhibitors include CTLA-4, PD-1 and PD-L1. The FDA-approved immune checkpoint inhibitors include Yervoy, Bavencio, Tecentriq, Imfinzi, Opdivo and Keytruda. Yervoy is the only CTLA-4 immune checkpoint inhibitors available in the global immune checkpoint inhibitors market. The PD-L1 immune checkpoint inhibitors is relatively new in the global market, which includes products such as Bavencio, Tecentriq, and Imfinzi. The blockbuster products in the immune checkpoint inhibitors market (Keytruda and Opdivo) are of the PD-1 drug class. The growing prevalence of cancer and increased FDA approvals are the prime factors expected to drive the growth of the immune checkpoint inhibitors market over the forecast period. However, the high cost associated with the research and development of the products consequently increases the cost of the final product and associated treatment, which is a factor expected to hamper the growth of the immune checkpoint inhibitors market. Besides, the high cost of the immune checkpoint inhibitors has led to regulatory price capping. The regulatory price capping of immune checkpoint inhibitors is also expected to hamper the growth of the immune checkpoint inhibitors market. Of all the immune checkpoint proteins, CTLA-4 is the best understood mechanism. However, under the CTLA-4 immune checkpoint inhibitors there is only one product currently available, i.e., Yervoy by Bristol-Myers Squibb. The CTLA-4 immune checkpoint inhibitors segment is expected to account sluggish growth in the global market, as nearly 20% of patients who used CTLA-4 have shown an allergic reaction, which is expected to restrict the adoption of the product for cancer treatment. Until 2017, there was only one PD-L1 immune checkpoint inhibitor available, i.e., Tecentriq by Roche Holdings AG. The immune checkpoint inhibitors market has two blockbuster products namely, Opdivo and Keytruda. Both Opdivo and Keytruda are PD-1 immune checkpoint inhibitors. Both the PD-1 immune checkpoint inhibitors products were launched in 2014 and are currently the only immune checkpoint inhibitors launched in China in early 2018. In terms of revenue, the global immune checkpoint inhibitors market is expected to be valued at US$ 35,178.0 Mn by the end of 2026. In terms of value, North America is expected to be the dominant regional market for immune checkpoint inhibitors by 2018 end and is expected to expand at a healthy CAGR over the forecast period. Asia Pacific is expected to witness significant growth in the global immune checkpoint inhibitors market. Examples of some of the key players covered in the report of the immune checkpoint inhibitors market are AstraZeneca, Bristol-Myers Squibb, Roche Holdings AG, Novartis AG, Pfizer, and Sanofi, among others. Companies such as Novartis AG, Sanofi and Incyte have their immune checkpoint inhibitor candidate in the pipeline and are expecting approvals in the near future. Most manufacturers in the immune checkpoint inhibitors market have a key strategy of entering into collaboration and agreement with other companies for better geographical reach for distribution of the product as well as for approvals to expand the indications of the products. For an instance, Bristol-Myer Squibb and Ono Pharmaceuticals have a distribution agreement where Ono will hold the rights to distribution on Japan, Taiwan and South Korea.